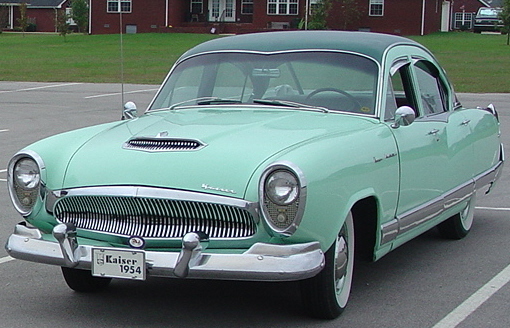 This 1954 Kaiser Manhattan was ahead of its time! This color combination is signal green metallic (top) and jade tint (bottom). From this Powder Blue 1954 Kaiser Late Special. to this Powder Blue 1954 Kaiser Late Special with Comet Blue Metallic top. Notice the narrow stainless trim on the side which distinguishes it from the top-of-the-line Manhattan.